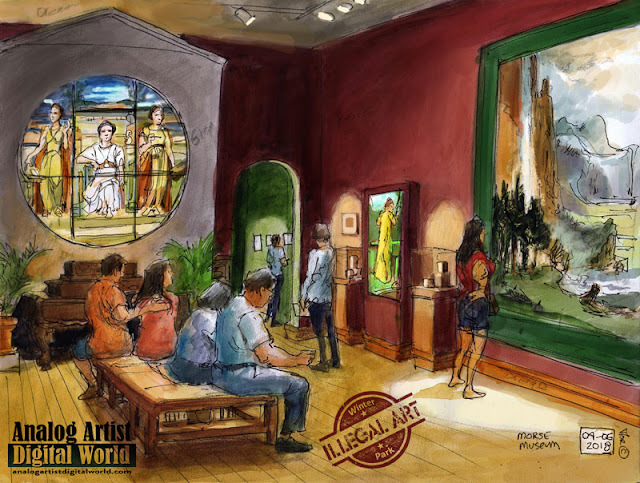 I settled into a seat and started sketching the monumental painting along with a round Tiffany stained glass window that dominated the gallery. I had finished the line work and was blocking in some color when a guard stopped me. She was concerned for the wood floors and asked me to stop. I have never spilled a drop of color doing my tiny watercolors, but she must have considered me an anarchist and or a slob. I added a few color notes like, Grey, Ochre, Orange, etc to let me know what my plan had been when I started painting. I then went outside the museum and sat on a bench to block in the colors there. That was an illegal act since sketching on Park Avenue is illegal in Winter Park. I walked back into the museum one more time to check the color scheme and went out to paint again. Outside it grew dark as the sun set. I grew discouraged and left. I haven't returned to the museum since. The Bierstadt is no longer at the Morse. Winter Park has an crazy back woods ordinance that prohibits the creation of art in it's downtown streets. It seems the Morse also considers sketching, an illegal act. My simple act of sketching on the public bench outside the Morse was an act of civil disobedience punishable with a $500 fine and or 30 days in jail. Welcome to the Central Florida arts scene.